Here’s another difficult weather / sky phenomenom to shoot. Rainbows are just so cool to look at but really hard to capture. I think part of it is that you usually only see a little bit of the rainbow or that they are faint in the sky. This one was when I was in Hilo Hawaii. We were coming back from a helicopter ride and it had been raining on and off. Hilo gets about 180 inches of rain a year so almost everyday something is falling. A rainbow will form when the sun is shing on the rainy part of the sky. I’m not sure about all the angles but if it’s raining and then the sun comes out, grab your gear and run outside. I think a polarizing filter would also help and I didn’t use one here. The colors here were boosted using vibrance and contrast in Lightroom. 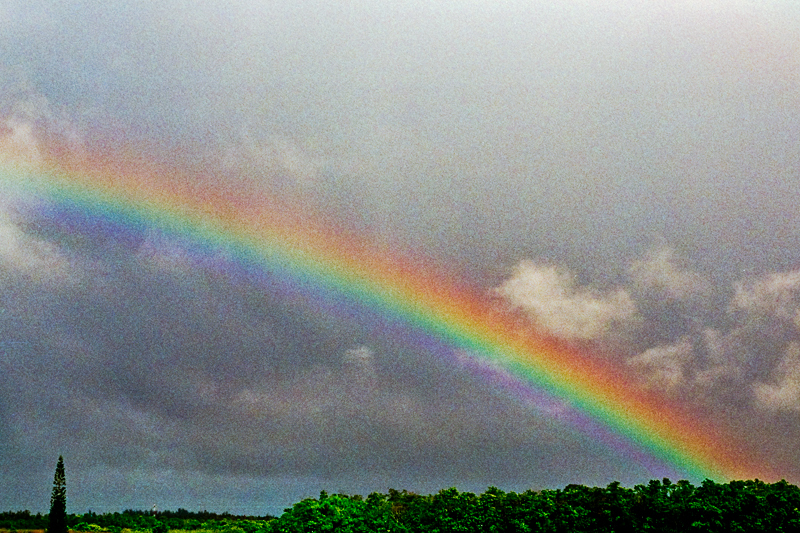 Be wary of rainbows in pictures that have very well defined colors and edges though, they were probably created in Photoshop with the radial gradient tool. I hope you find the pot of gold at the end of your next rainbow. This entry was posted in Clouds, Hawaii. Bookmark the permalink. I was wondering if you allow people to copy & paste some of your pictures for their facebook wallpaper. I really like enjoy your Hilo rainbow picture, but I know there are copy write laws and I would not like to use your picture if you don’t want it. Either way, thank you for taking the beautiful picture!